Almost anyone who knows me knows about my passion for yoga. Apart from offering a complete body workout, this holistic practice keeps me fascinated about how ancient yogis understood so much about the human body that science is corroborating now. Similarly, the knowledge on which regional Indian cuisines are based is astounding. While the world is now waking up to the benefits of eating seasonal foods and varying cooking techniques in keeping with the season, all this has been inherent in the cuisine of the world’s oldest living city – Banaras. Recognising the importance of our culinary heritage the Oberoi Hotels launched Rivaayat – The Indian Culinary Conclave. Much more than just a food festival, Rivaayat actually focuses on the revival of traditional Indian cuisine. A lot of research goes into each cuisine that is showcased. An expert on the cuisine is brought on board who then teaches traditional recipes to the Oberoi team, incorporating authentic ingredients as far as possible. Very often traditional recipes don’t have exact measurement of ingredients, since ‘chutki’ (a pinch), ‘mutthi’ (a fistful), etc were commonly used terms while passing down family recipes. These measures are weighed and standardised till the recipes are perfected, documented and photographed. While this practice facilitates in replicating a festival authentically across the properties of The Oberoi Group, it also helps in keeping a specific cuisine alive. And besides promoting a food festival, the hotel offers a wealth of information to in-room guests. There would be leaflets featuring the history of the specific region where the cuisine originated, some nuggets of information regarding the cuisine and even little samplers left as treats during turn-down service. 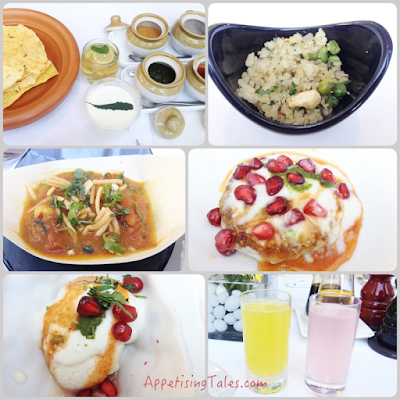 So far the cuisines showcased through Rivaayat have been those of Rampur, Dehlvi, Awadh and Banaras. Banaras has been on my must-visit list for a while, especially since the cleanliness drive has started there under the Swachh Bharat Abhiyan. Apart from an interest in experiencing this ancient city, a conversation with a friend really piqued my interest. This friend of mine rarely ever talks about food, but I was amazed when she came from Banaras and we talked on the phone for over an hour about all the Banarasi specialties she ate (needless to say, it was mostly a one-sided conversation). I was only left wondering, ‘if this person can be so fascinated with the cuisine, how good the food must really be’! While Chef Ravitej Nath (the then executive chef at The Oberoi, Gurgaon), has been at the helm of all the Rivaayat series, the expert brought on board to curate the Banaras festival was Sangeeta Khanna. Sangeeta blogs about healthy recipes at HealthFoodDesiVideshi.com and about traditional recipes at BanarasKaKhaana.com. Having done her research on microbial biotechnology, she is a practicing nutrition consultant. She knows the right ways of using ingredients to optimize their nutritive value, and is an expert when it comes to using food as medicine. Her blogs feature lots of recipes using local ingredients and Indian super foods, alongwith their nutritional benefits. Since I have the good fortune of knowing her personally, she is my go-to person for any query related to eating for good health. Sangeeta and Chef Ravitej went to Banaras to buy local ingredients as well as artefacts to showcase during the festival. Aloo ke papad, hara chana, short grain rice and special mithais were all brought from Banaras, as were the wooden donas for the chaat or kulhads for desserts. We start our meal with Aloo ke Papad accompanied with lip-smacking chutneys. There is wadiyan ki chutney, khus khus ki chutney, tomato chutney and dhaniya aur pudiney ki chutney. This is followed by Chivda Matar, Banarasi Tamatar ki Chaat; Aloo Tikki and Chhena ka Dahi Wada. Although some of these sound familiar, I have never had stuff like this. Even the simple sounding aloo tikki is filled with moong beans. The tamatar ki chaat is a specialty of Banaras and I am so glad to get a taste of this sweet and sour street food right here in NCR. And I almost fall in love in with the chhena ka dahi vada that is served with yoghurt and tamarind chutney. And how can drinks be left out when the food of a region is showcased. Thus there is Khus ka sherbet, Aam Panna and Thandai. Bottom L-R: Chhena ka Dahi Wada; Cocktails. Next in line are the Fara; Masoor ki Bhapouri, Hare Chane ka Bhabra; and, Bajka. 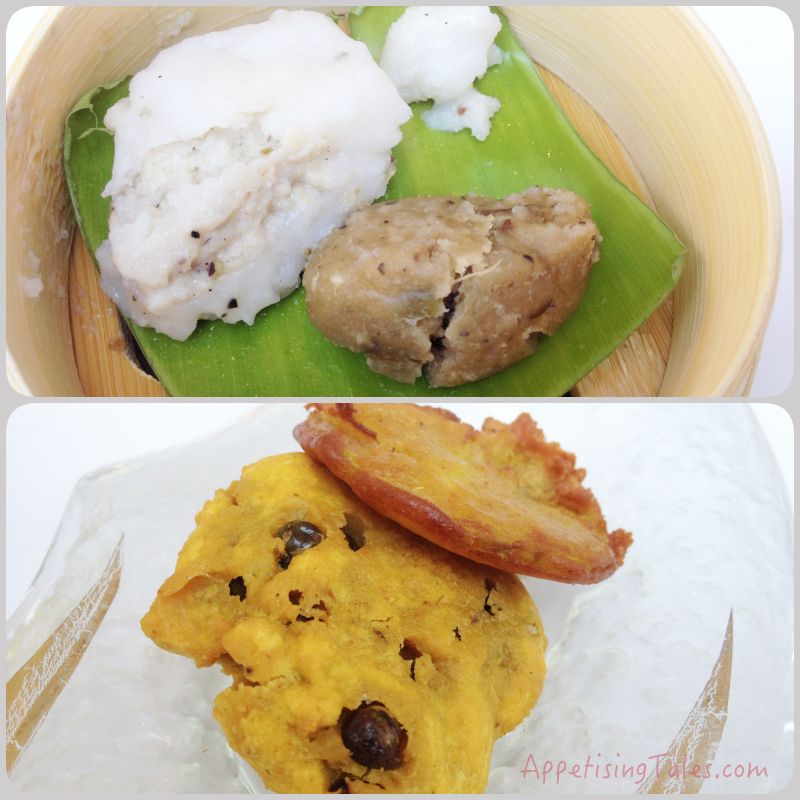 Sangeeta emphasises on using the traditional names of dishes in order to keep a cuisine alive. While Fara is a rice dumpling filled with spiced lentils, masoor ki bhapouri is a steamed dumpling filled with masoor dal and spices. Hare chane ka bhabra is a kind of pakoda made with what I know as chholiya. And believe it or not bajka is lauki ka pakoda - a delicious way of having bottle gourd for those who find it too bland for their palate. Bottom: Hare Chane ka Bhabra; Bajka. Banarasi food is not entirely vegetarian. “Although most households didn’t cook non-vegetarian food at home, meat was often cooked in earthen pots at picnics,” says Sangeeta adding that picnics have always been very popular in Banaras, especially “across the river”. 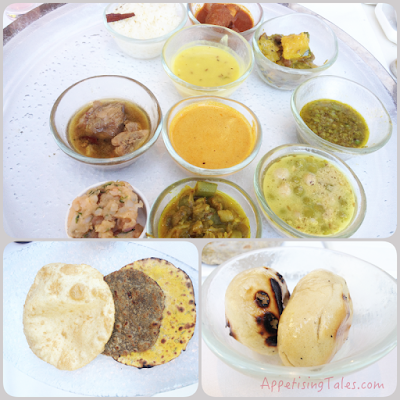 My thali features Sarson wali Machhli or sole cooked in mustard gravy, Chicken Ishtoo or stew cooked with onion and whole spices and Mutton Kaliya or spiced lamb curry cooked in mustard gravy ‘picnic style’. The vegetarian dishes include a delicious Matar ka Nimona, crushed green peas with coriander and ginger, Turai ki Pyaz wali Subzi and Sagpaita, or tempered moong dal with baby spinach. Along with the assorted rotis there is also the famous litti. The flavours of all the dishes are clean and simple, and it is this simplicity and a home-cooked appeal that makes the entire meal delicious. Bottom L-R: Assorted Rotis; Litti. The desserts are as fascinating and extensive as the rest of the meal. When one talks about Banarasi specialties, how can Malaiyyo not be mentioned? This ever so light dessert is fragrant and India’s answer to a soufflé. Since Holi is round the corner, there is the Gujhia. Amongst other specials are Biranji Kheer and Hare Chane ki Barfi. While I like the barfi for its texture, I love the kheer that has tiny makhanas in it. I am happy to be informed that makhanas or fox nuts are super healthy and a rich source of calcium. And finally, the part that takes me back to my childhood. The Shri Ram Bhandaar ka Laal Pedha and Sankatmochan ka Laddoo have been sourced from the said establishments, where they are made with the same recipes for over 300 years. I used to look forward to my favourite uncle’s bi-annual visits to Banaras since he used to get both these sweets for us. 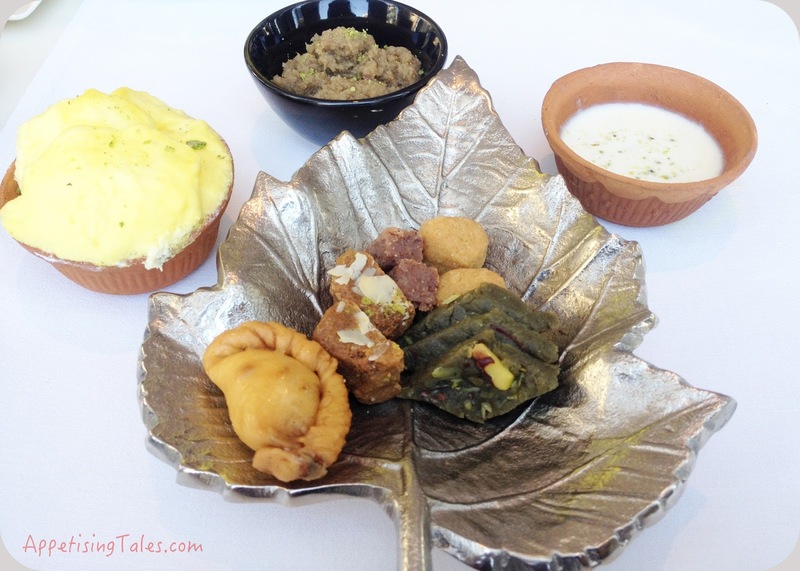 This festival took me on a culinary journey to Banaras, as well as a sweet walk down memory lane. Shri Ram Bhandaar ka Laal Pedha; Sankatmochan ka Laddoo. 443, Udyog Vihar, Phase V, Gurgaon 122016.